Our range of products include foil metal detector and ferrous in foil metal detector. We make available Foil Metal Detector in different specifications so as to cater to variegated requirements of the buyers. We are counted among the top companies, which are engaged in manufacturing, exporting and supplying Foil Metal Detector. Manufactured under the observation of experts, our Foil Metal Detector is known for its longer functional life. One can place retail as well as bulk orders for Foil Metal Detector with us. Ferrous in Foil Metal Detector is equipped with audio visual alarm to draw the attention of operator. The Ferrous Metal Detector is energy efficient and ensures trouble free operation. The Ferrous Metal Detector has automatic balancing facility and supports dual channel operation. Energy Efficient Ferrous Metal Detector has automatic adjustment facility for temperature variation. 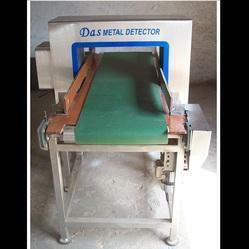 Das Electronics is the manufacturer of Energy Efficient Ferrous Metal Detector. Das Electronics is the supplier of metal detectors like bag metal detectors, capsule metal detector, gravity feed metal detector, pipeline metal detector, needle detector and tablet metal detector. This range of products find application in various industries like food and beverages, pharmaceuticals, garments, plastic processing, packaging industries and other industrial organizations.